Best Glitter Mehndi Designs – Have you heard the phrase “Everything with Glitter is Better”, so this phrase can also be referred for mehndi. Adding glitter in mehndi is the latest trends in 2019 because it can be easily wash out with water or simply peeled off when dried out. Young girls who love the shimmers, jewels etc that includes glitter also, glitter mehndi designs are quite popular in them. They might want to sneak peek into this article. This article brings 30 cute glitter mehndi designs, all glitter lovers would want to have a look at them. By adding A certain amount of glitter or sparkle to mehndi gives it the radiance. Apply glitter an hour earlier before going to the occasion. Let it dry completely as it takes time to dry. Buy Cosmetic Glitter as quality matters. Avoid Water as it is water – soluble. The glitter and jewels added in the black mehndi design make the hand backside look stunningly awesome. All age group of girls can opt this design for some festival. The paisley, blooming bud and blossoms on one side of the hand in the form of a vine compliments each other a lot and enhances the hand beauty. As glitter mehndi is well practised today. With it, one can add color and elaborate the mehndi design. Like as in the mehndi design below in the photo the full hand is covered with brown mehndi and its central portion where the paisley exists, is outlined with blue and golden color glitter. That makes the mehndi designs look more beautiful, attractive and very stylish. In short, the shimmering and sparkling colors of glitter becomes the point of attraction and enhances beauty in compare of the pain brown mehndi. 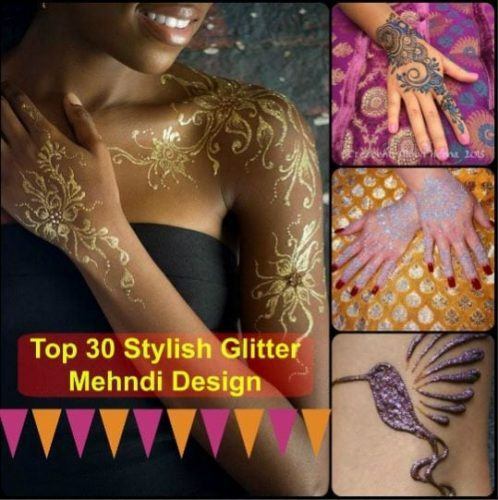 Want to razzle-dazzle with glitter then just go for this glitter mehndi design. As this glitter mehndi design is very well elaborated and intricate. The hidden peacock in the design makes the design look extremely good. This aquamarine blossom wave glitter mehndi design in the photo adore the palm and forearm beautifully. The creepers, blue glittered flowers, and the leaves with spirals compliment each other very well. Want to make a less complicated design then one can reduce the number of vines and keep the mehndi design on the backside of palm only. This glitter mehndi design with the flower as a motif, leave vines going outwards to the index finger of the backside of the palm makes the design look marvelous. One must have noticed that everything that had glitter on it grabs the attention and becomes the point of attraction, therefore, the flower motif filled with blue and gold glitter makes the entire design alive and vibrant. Gold glitter design in the photo below is so intricate and when gorgeous rhinestones added in the blossoms vine complement each other so well that brings out the whole design very elegantly. The delicately designed golden color glitter mehndi on the body parts not only enhances the beauty but also makes one look fashionable like in the photo below. For summer season this design would work fantastically for glitter lovers. This Glitter mehndi design not only adds shimmer to the mehndi but also helps to last longer. Girls who adore radiance and want to stay for the longer time period they can adapt this methodology. The glitter mehndi is absolutely safe for skin. One can apply it as mehndi but remember that it’s not mehndi. The Sliver glitter mehndi design in the photo is looking absolutely stunning with the red nail paint. All young girls can opt this design. Note that glitter quality is very important. The Art and Craft glitter can’t be used for this purpose as it can irritate and scratch the skin. Remember that only use cosmetic glitter. One can imagine that their hands are shrouded in precious stone. If uniqueness is your style then surely you would love to add glitter in mehndi design. Don’t get tangled, this glitter mehndi design that’s a hummingbird is one latest trend and is unique. The modern tikka style as a central motif in this design not only enhances the beauty of hand but also makes it stylish. The blooming flower in the design with the purple and blue glitter brings out the design very well in a way that traditional tikka style is turned into a modern look. Even though the full hand is not cover in mehndi. This glitter mehndi design is not as simple as it looks. The thick green roses are quite prominent and are neatly done. Green glitter applied on the mehndi that is to dry gives this design a completely different look. 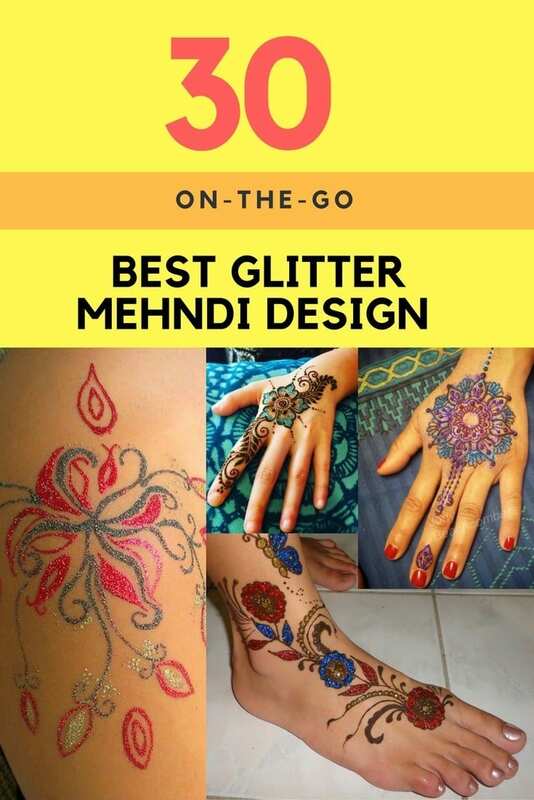 Planning to attend a festival then adding glitters, jewel, and gems will make your glitter mehndi design standout from all your friends in the same event. This soothing lavender glitter mehndi design in the photo below will do all the work for you, as it is one gorgeous design. But if your outfit is of different shade then can opt for that shade of glitter that balances or compliments the outfit. It’s never a compulsion that mehndi should always be on hands and foot. Instead of that one can also apply it on the back, shoulder etc. This glitter design is resembling a tattoo style implemented with two shades of glitter. Just make your own fashion statement. Interest in getting a tattoo? This article brings you to the easiest and the prettiest way to have it. The photo below carries an Aerial Bird as a glitter mehndi design. The mixed colored glitter sprinkled over the brown mehndi makes the whole design go wow. Adding Glitter to the design do avoid trouble, as it covers all the flaws present in the design with all the shine.